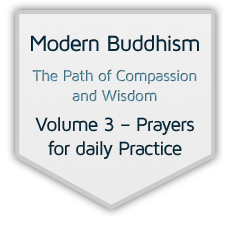 This eBook Modern Buddhism – The Path of Compassion and Wisdom, in three volumes, is being distributed free of charge. The author, Geshe Kelsang Gyatso, says: “Through reading and practising the instructions given in this book, people can solve their daily problems and maintain a happy mind all the time.” So that these benefits may pervade the whole world the author wishes to offer this eBook freely to everyone. Volume 1 – Sutra is a practical guide to the common spiritual paths which lead us to fulfill our common wish – to attain both permanent liberation from suffering, and pure and everlasting happiness. Volume 2 – Tantra is a practical guide to the uncommon spiritual paths which lead us to the attainment of full enlightenment, the ultimate goal of human life. Through reading and practising the instructions in this volume, we learn to integrate these profound teachings into our daily activities, and in this way we can enjoy a supremely meaningful life. Volume 3 – Prayers for Daily Practice is a collection of prayers for our daily training in Buddha´s Sutra and Tantra teachings. These prayers are a special method to purify our mind; to accumulate a great collection of good fortune and wisdom; and to receive the blessings of the enlightened beings. Through accomplishing these internal conditions, we can easily attain the realizations of the common and uncommon spiritual paths.